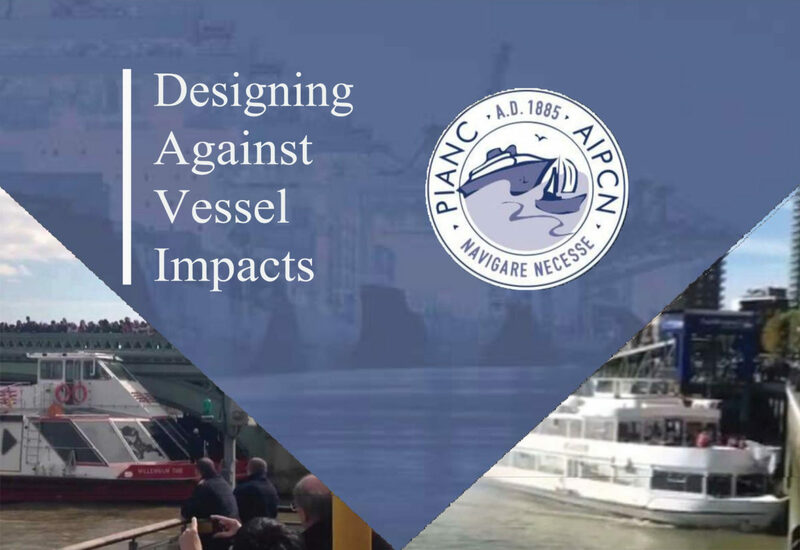 Beckett Rankine is pleased to have sponsored, jointly with Marico Marine, PIANC’s half day seminar on designing infrastructure against vessel impacts. This is a topical subject which has been the subject of much debate on the Thames Tideway Tunnel project where a number of cofferdams are being built out into the Thames where they are at risk from being struck by passing vessels. Within the cofferdams are deep shafts connected to the tunnel and, during construction a large number of workers can be in the tunnel. Consequently the cofferdams are being designed to withstand impact from the largest passing vessels. Proposed new bridges over the river, such as Nine Elms to Pimlico and Rotherhithe bridges raise similar concerns about what is an appropriate impact energy to use in the design. Further downstream the problem becomes more acute as ship size increases. The cable car pylon which is in the river could not economically be protected against the largest cruise ships, weighing over 20,000t, which pass it. It has a relatively light impact boom and the cable car is taken out of service whenever a large ship passes. This is not an ideal solution. PIANC’s seminar assembled a range of authoritative speakers who each approached the issue from a different perspective. Joanna Dorman of the MCA looked at build standards of vessels; Marico’s Andrew Rawson took a probabilistic approach to vessel allisions; Captain Jae Jones of the MAIB reviewed the causes of vessel impacts; Arcelor’s Graham White considered how steel sheet piles perform under impact; Beckett Rankine’s Ian Dobson discussed designing floating piers for vessel impact and finally PLA Harbourmaster Mark Towens explained how Zero Harm is being targeted on the river. A number of the presentations can be downloaded from PIANC. The sold out event created a great deal of debate. It became clear that further research is needed, especially as we are now designing more collision susceptible structures, such as passenger piers, in the lower reaches of the river where large ships operate. We will be organising a further event on the subject in due course.